Not only is oat milk a vegan alternative to regular milk, it is super quick and easy to make and can be made from as little as two store cupboard ingredients; Oats and water! The low cost of these ingredients means, unlike many nut based milks, this is the cheapest option available. It is also nut free making it the perfect alternative for those with nut allergies. However, there are some important tips and tricks that can be used to ensure you get the best quality milk. 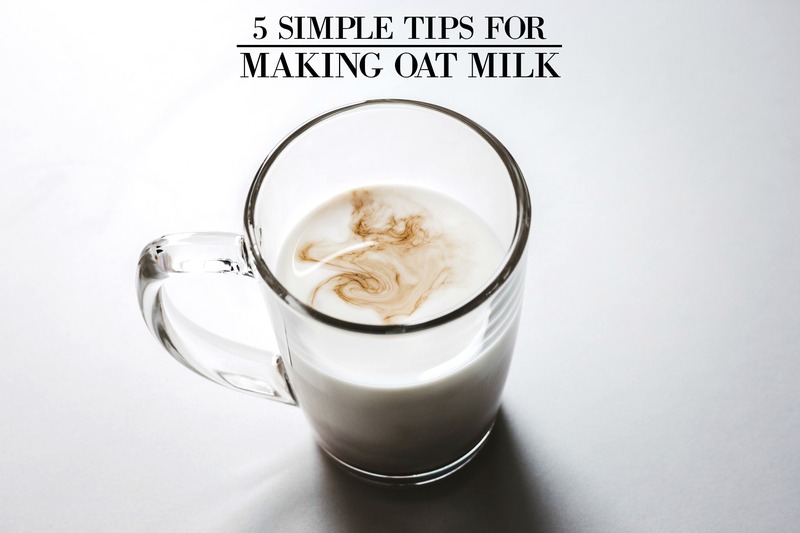 After soaking the oats in water, it is important that you discard this water and rinse them THOROUGHLY in order to prevent your milk from becoming too thick and slimy. After blending your oats for around 5 minutes, you need to strain out the pulp. This can be done with either a nut milk bag, cheesecloth or even just a regular sieve. If you are intending to make oat milk on a regular basis, it is well worth investing in a nut milk bag! After straining through the milk and discarding the pulp, rinse out your bag/cloth/sieve with water and repeat this step again. This will produce a much smoother, silkier milk. Tip 3: Want More Flavor? If you want to add a little sweetness to your milk, there are a number of natural ways to do this. Adding just one date into your mixture makes it the perfect milk to add to coffee and tea. It also makes it great for kids to drink. Other natural sweeteners can be vanilla essence, maple syrup, honey, cinnamon etc. A little trick is to add a pinch of salt as this will help to really enhance those flavors. If you are intending to add this to a latte or cappuccino, it is important that you DO NOT heat the milk beforehand as this will create lumps and make it much too thick. Using a steamer or milk frother is a definite no no with oat milk. Adding it to hot drinks is fine though! Do not be put off if, when you return to your milk in the morning, it has separated. When separation occurs this does not mean that your milk has gone bad! Separation after storage is natural, just give it a good shake! Oat milk can last up to 5 days in the fridge if it’s in a sealed container. Whether you’re vegan or you just want to have a few less calories in your coffee, oat milk is definitely a great way to go. So try these tips out and let me know what you think!